Clearly and easily communicate information about workplace hazards with Right-to-Know & HazCom Labels. 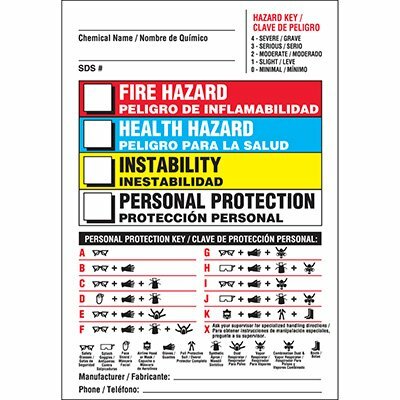 Choose from Roll Form, Self Laminating, Custom and other types of labels to inform employees of all potential chemical hazards. Comply with safety regulations with Seton's Right-to-Know Labels. Right-to-Know & HazCom Labels are used to inform workers of hazardous chemicals, etc. in their facility. Right-to-Know Labels depict the dangerous chemical compunds or hazardous materials that are present. HazCom Labels are similar in that they are affixed to hazardous items or areas to draw attention to the present condition. Seton offers Hazwaste & Drum Labels-On-A-Roll, HazCom Labels for Substance Identity and more.